Situated on the westerly coastline, Oregon is counted among the top paying states of the United States. CNAs appointed in OR earns mean annual and hourly wage of $27,720 and $13.32 respectively, according to the US Bureau of Labor Statistics, in May 2013. However, location, work experience and the company’s budget are a few factors that influence the pay scale of the nursing aides. The number of certified nursing assistants employed in the year 2013 was 11,200. Employment per 1,000 jobs was reported to be around 6.83. The average CNA salary in Oregon, according to indeed.com (as of January 2015) was $24,000. It was 3% lower as compared to the national average CNA salaries. 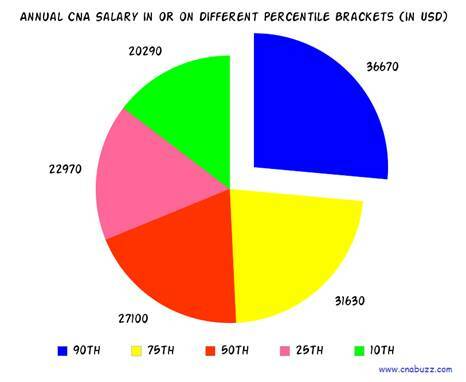 The table below reveals the income of certified nursing assistants on different percentile brackets. 90% of CNAs made less than $36,670 while 10% made more than $36,670. 75% of certified nurse assistants were waged less than $31,630; remaining 25% offered more than $31,630. 50% of the employees were paid less than $27,100; rest 50% received more than $27,100. 25% were remunerated less than $22,970; 75% were paid more than $22,970. 10% of employees received less than $20,290; 90% made more than $20,290. Geographical location plays a major role in deciding the salary of a certified nursing assistant. It may be surprising for a few, but the salary range fluctuates in every city and state. Bend was the lowest paying city with median annual and hourly salary $27,001 and $2,250 respectively. Eugene offered the maximum salary, i.e. $32,702 per annum. The monthly median wages in the state ranged from $2,250 to $2,725, and hourly median wages ranged from $13 to $16. Those holding higher degrees are offered better designation and pay. 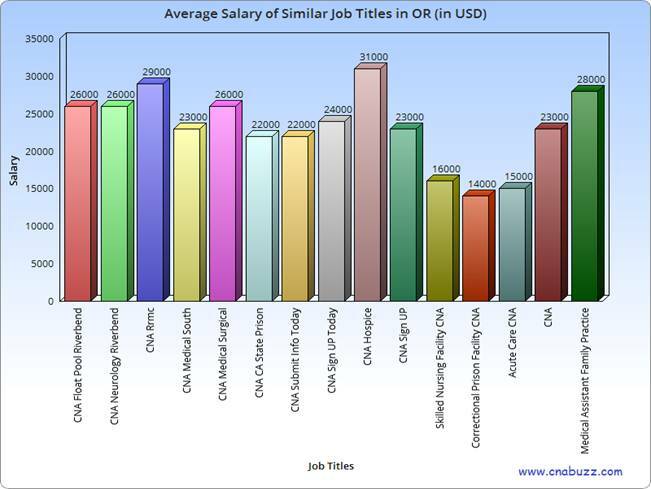 In January 2015, the job title, that got the highest salary was CNA Hospice with annual salary $31,000. CNA Rrmc made $29,000. The average salary of other certified nursing assistants with related job titles ranged in between $14,000 and $28,000. The expected job growth for certified nursing assistants is comparatively faster as compared to other occupations. The increasing number of elderly people has raised the demand of CNAs. According to the BLS, home health services and community rehabilitation services will provide the best job opportunities in the year 2012-2022. The dependence of nursing homes on government funding may lessen the demand for these employees at nursing homes. Question 1 – Currently, I’m working as a certified nursing assistant in Corvallis where I get an hourly salary of $15. I’m planning to move to Clackamas in a couple of months, how much salary can I expect there? Answer – As per salary.com, the median annual, monthly, weekly and hourly salary of a CNA in Clackamas was $31,719, $2,643, $610, and $15 respectively. Question 2 – My certification is almost complete, and I’ll obtain my CNA degree in a few weeks. Which job title I should target to earn better? Answer – In the state of Oregon, CNA Hospice is the highest paid job title with annual income of $31,000. CNA Rrmc ($29,000) and Medical Assistant Family Practice ($28,000) are also paid well.